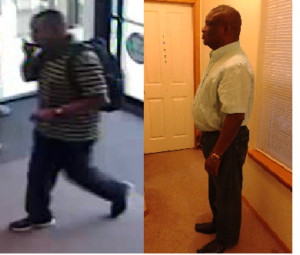 Side by side comparison of the man from the surveillance video (left) and Mr. Cole (right). Kafoury and McDougal has filed a lawsuit against Kaiser Permanente on behalf of Reginal Cole for a false arrest which occurred last year. Mr. Cole was falsely accused of stealing Dr. Douglas Ackerman’s wallet while at the Kaiser Sunnyside offices for an appointment. At 4pm on June 22, 2016, Mr. Cole went in for a weekly appointment in a series of invasive medical procedures at Kaiser Sunnyside. After finishing the treatment, the nurse told him to get dressed. Before Mr. Cole had even finished getting dressed, a police officer entered the room and accused Mr. Cole of stealing a doctor’s credit card and using it at the JC Penny at the Clackamas Mall on June 15th. Mr. Cole denied these accusations. The officer told Mr. Cole that he was under arrest and handcuffed him. Mr. Cole was escorted out of the medical office, in front of a crowd that had gathered during the confrontation, and taken to Clackamas to be booked. Mr. Cole spent the night in jail. He was not given any information on when the alleged theft had taken place or any other details of the accusations against him while he was in custody. He was released the following afternoon. Police had sent Dr. Ackerman photos which had been taken from the JC Penny surveillance videos, showing the suspect. When police next talked to Dr. Ackerman, he revealed he had not looked at these photos but had compiled a list of patients who were treating at the offices at the time of the theft. When told that the suspect from the surveillance videos was a black male, Dr. Ackerman then named Mr. Cole as the man who had stolen his wallet and used his credit card, even though he had not looked at the photos of the suspect from the police, because Mr. Cole was the only black male on the list. According to the police report, a black male had been caught on security footage walking into Kaiser at 3:57 pm on June 15 and leaving the facility at 4:12 pm. This man then used Dr. Ackerman’s stolen credit card at the JC Penny at 4:23 pm. Mr. Cole’s appointment on June 15th had started at approximately 4:00 pm and lasted until around 4:45 pm according to his medical records, which means that he was in his appointment both when the suspect left the Kaiser facility and when the card was used at JC Penny. Any thorough investigation would have uncovered these details immediately, preventing Mr. Cole from the humiliation, confusion, and frustration of being falsely accused of theft. We are asking $250,000 in noneconomic damages and for fees he paid the criminal defense attorney who exonerated him.